7:26 am - Friday - 40 F degrees, humidity 65%, wind - calm, clear blue skies, sunny....forecast high today is 68 F degrees. Slept 9 hours last night for the second night in a row. Thursday morning I spent time with Guy and Sue helping orient them to owning a Newell. Since each Newell is unique there is a steep learning curve......things I helped them with included using the inverter.....there are several switches to activate in this '84 Newell for it to supply power to a select number out outlets in the coach. Mine is a little different in that I only have to turn a dial from generator to inverter to get power at ALL my outlets. Another issue was where were the thermostats which control the salon and water bay electric heaters.....it turned out they were hidden under a hinged panel over the door. I showed them how to deploy their ZipDee patio awning....deploying a ZipDee patio awning is anything but intuitive. We also went over the leveling system, the auxiliary compressor, and the air system......the air system seems to have a big leak as the compressor comes on every 15 minutes. It reminded me of the process TLE and I went through the first time we went camping in our Newell.....everything was new.....our learning curve went on for close to two years. At any rate the two hours went quickly, and I think Guy and Sue have a little better understanding of the basics. As I walked around the outside of the 1984 Newell I began to remember all the things I had worked on for Todd, the former owner......I installed the LED tail lights, and front LED turn signal lights, the crank up Winegard satellite dish, the new front bumper, I helped polish those ALCOA wheels, I helped repair the hinge on the electrical bay door, and probably a few things I have forgotten. It was like visiting with an old friend for a couple of hours. Soon it was time for me to go to work.....TLE once again went in at Noon, and I followed at 2 pm. 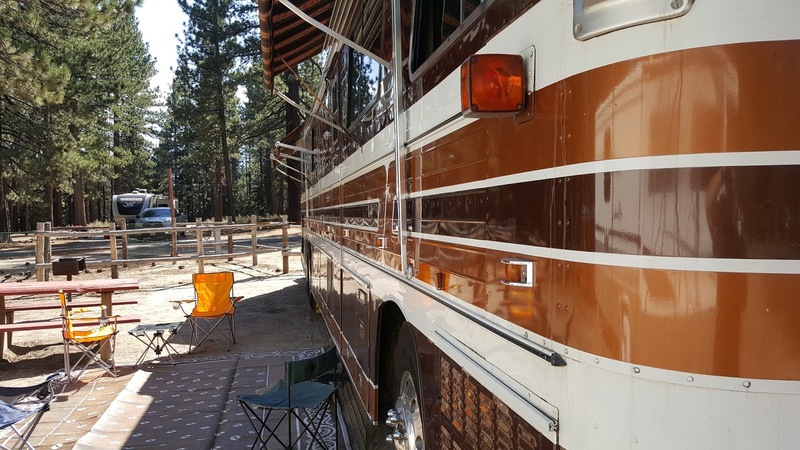 My first task of the day was to install mini-blinds on two windows in the administrative office at the entrance to the campground. I love projects like this, and within two hours they were installed and ready to use. 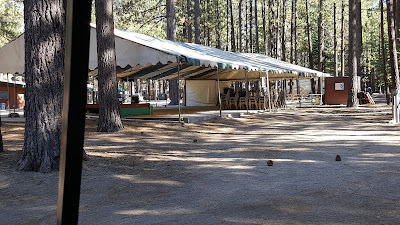 I then did site checks.....we are just under 70 RV sites occupied....we will probably have a few more over the weekend, but I think we've already seen the last weekend with over 100 sites occupied. Within a few days Section E will be empty except for two sites.....ours and Miguel's (head ranger), and we will be moving shortly thereafter. Within a few days of that we will begin to winterize E, A and F.
The rest of my 4+ hour shift consisted of pumping propane, mopping out the laundry and lounge rooms, locking up the maintenance yard, running invoices out to customers, updating site tags, and twiddling my thumbs.....:-) We closed the office/store at 6 pm, and were home before 6:30.....it was a little weird to be driving home between 6 and 6:30 and seeing how close to sunset it already was, and how quiet the campground was......TLE and I are getting used to the unusual quiet and, in fact, are really beginning to enjoy it. 8:22 am - Thursday - 44 F degrees, 56% humidity, wind 5 mph out of SSW....partly cloudy, but sunny......forecast high is 72 F degrees.....beginning to cool down once again....9 hours of sleep last night. I hadn't taken a bike ride for a while....maybe close to a month.....which is unusual for me, but, as you know, I did have an excuse......my heel injury. At any rate I was determined to get out for a modest ride Wednesday. TLE was going into work at noon, but I was not going until 2 pm......just not enough to do. Whenever I get on my bike to take a ride I rarely ever know how far, or which route, and that is how I began my ride Wednesday around noon. As I approached US-50 I opted to take 'D' Street over to Lake Tahoe Blvd. to pick up the bike path there. As I crossed back over Lake Tahoe Blvd. to continue on the path along Sawmill I decided I would continue on to the end of the bike path in Meyers. Normally I would make the turn around just past the 'Divided Sky Restaurant' and then cross over US-50 to ride back to TVC, but as I made the turn I decided to stay on the bike path and take it all the way back to 'D' Street and home. I ended up doing just about 14.3 miles and did it in just slightly over 1 hour. ..... here are only three RV's left in Section A, six in Section F, and maybe 11 in Section E (and two of those are staff members). The A restroom has been winterized, and the restroom in F is probably next with E shortly behind. By the middle of next week we will be down to G which is always open. The pool has been mostly drained and winterized. The shelves in the store are becoming bare as we let the inventory wind down for the season. ......we still had the T-Bird back then. I guided Guy and Sue over to site 427, right next to us, then left them to finishing setting up while I went back to work. 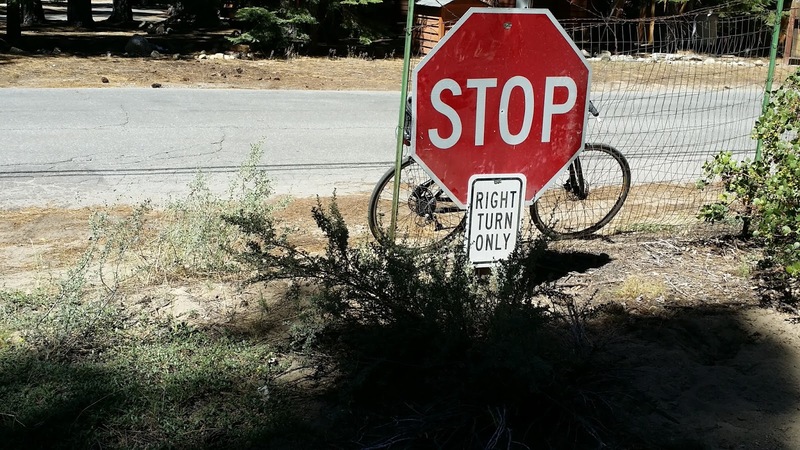 Guy and Sue had planned to arrive around Noon time, but Jello disguised as road construction along US-395 slowed them down, and they did not arrive at TVC until after 3 pm. TLE and I both clocked out at 6 pm, and headed for home.......Wednesday was also the end of the current pay period.....I worked just 69 hours the last two weeks which is more like it! We quickly changed clothes and then began the walk over to Lake Tahoe Pizza with Guy and Sue. We were there almost two hours, but the time seemed to just fly by as we talked about everything Newell. We are looking forward to the next 5 days working with Guy and Sue on their Newell learning curve. 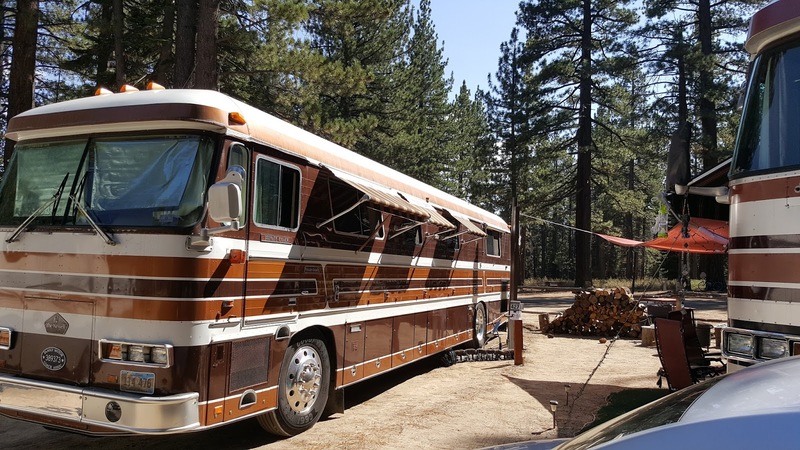 We first met Guy and Sue back in early April (click here for that story) when they were just beginning to think about fulltiming, and buying a Classic Newell. 8:42 am - Wednesday - 37 F degrees, 66% humidity, wind 3 mph out of SW, sunny with clear, blue skies.....once again. Went to bed at 11:30 pm, and slept until 8:20 am.....suweet! 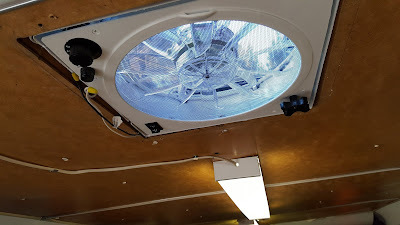 While TLE was out shopping I got busy finishing the installation of the Fantastic Fan in the trailer. It took me a little less than an hour to cut the inside trim down to size, permanently wire up the power, and install the trim. It works just as I hoped it would......Tuesday the temp got to 80 F degrees, so I was able to test how well the new fan would vent out the hot air which collects near the ceiling on a day like Tuesday. Within minutes of turning on the fan it was cool again inside......it is sooo quiet......SUWEET! I didn't go to work until almost 3 pm......there were too many people on duty, and I wasn't sure there would be much for me to do beyond doing site checks, and checking on another reported hole in the fence along Melba Drive. There were only 90 sites occupied Tuesday, and I was done with my site check round within an hour. TLE was still feeling a little under the weather, so decided to stay home, which was fine as there were very few customers. As it turned out there were FOUR new holes in the fence, not one. They were all intentionally cut. Now some might be really irritated by that development, but what else have I got to do? The way I look at it I get paid $10/hour to fix the fence.....whoever is cutting it is doing it for free. Since I have lots of time on my hands I can really spend time closing each breech in such a way that it would take someone more than minutes to open it there again.....maybe close to an hour. It seems there are a few folks who live across the street (Melba) from TVC who are bordering on militant when it comes to having a sense of entitlement to access our property, so I think I'll be kept busy closing breeches in the fence for the foreseeable future. I stayed busy until after 7 pm, and finally clocked out at 7:20 having clocked 4.5 hours of work.....suweet! 7:45 am - Tuesday - 35 F degrees, humidity 68%, wind 4 mph out of the south, sunny, cloudless skies.....forecast high - 80 F degrees. Since we did not go to bed until 1:40 am Monday morning, we did not get up until after 9 am Monday, which means we did not head for Carson City until almost 11 am. 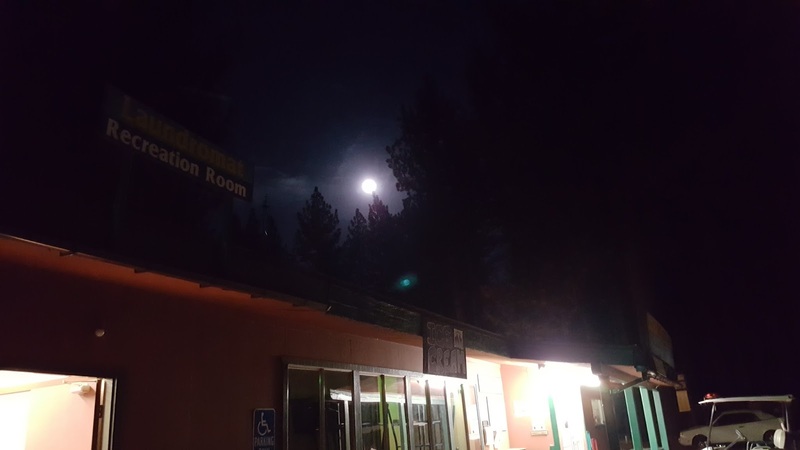 We had intended to head down to Carson City much earlier, but our choice to stay up late essentially made an early departure time out of the question. As a result our plan to spend time at the beach in the afternoon was no longer an option......I desperately needed a haircut, we were out of Scotch and other necessary sundries, so not making the round trip was out of the question. 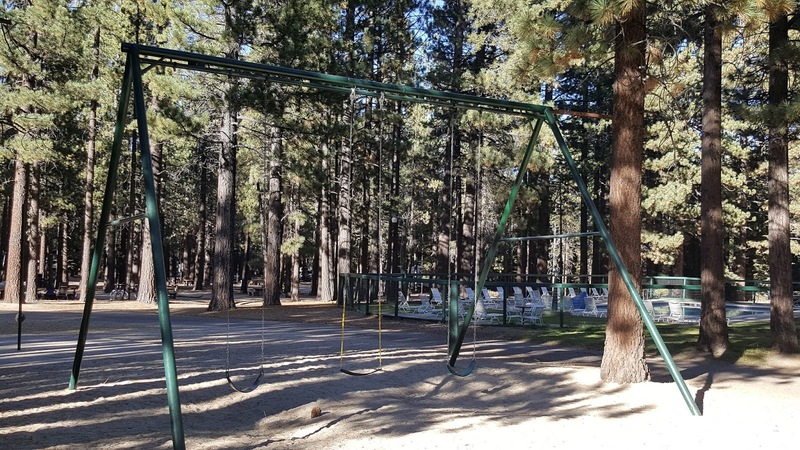 The forecast high for SLT Monday was 80, which meant it would be over 90 F degrees in Carson City, and it was. After all the cold last week it was nice to walk around Carson in flip flops, shorts and a t-shirt. Our first stop was Supercuts where I was able to sit down immediately for my haircut. I was 'in and out' in less than 20 minutes.....then it was time for our In-N-Out Burger fix. TLE occasionally orders her cheeseburger in a lettuce wrap, which has no appeal to me whatsoever......when I go to In-N-Out I don't want a salad, I want a burger with a bun! 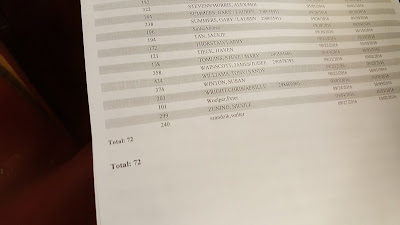 We both usually order their #2 Combo (Cheeseburger, fries, drink), so while she waited in the short line I went to the bathroom.....by the time I returned she was just finishing the order....we were customer #85. As it turned out the person taking TLE's order misunderstood and had two lettuce wrapped cheeseburgers made.....oh well, there's a first time for everything, so I went ahead and ate it that way. One thing I learned is I will not be doing that again. We only had three more stops to make in Carson City after lunch.....Walmart, TJ's, and Costco.....we were headed back up to Spooner Pass by 2:30 pm. After a quick stop at Dart/King Liquor near Stateline we were home by 3:30. TLE spent the next 90 minutes putting everything away from our shopping foray, and I took a nap to catch up just a little on my lost sleep from the night before. We chose not to watch the Presidential debate......I heard there were going to be three people debating.....Donald Trump, Hillary Clinton and Lester Holt....that's funny, I didn't realize Lester Holt was running for President. At any rate, we had no interest in watching the three interrupting each other, talking over each other and making outrageous claims about each other for 90 minutes.....I would rather watch a horrible Monday Night Football game between the Falcons and Saints....which I did. We were in bed by 11 pm......Monday was a good day, a relaxing day.....my kind of day! Thanks for stopping by! Sunday was the warmest day in over a week....I was looking forward to sitting outside watching NFL Sunday Ticket....my boys, the Denver Broncos, once again were not being televised in their away game at Cincinnati scheduled for 10 am, so I was once again grateful I had purchased the Sunday Ticket. TLE suggested we walk over to Bert's Cafe for breakfast before beginning our NFL gluttony, so we began hoofing it over around 9:45 am.......yep, I would miss the first quarter of the Broncos/Bengals game for a plate of Bert's Huevos Rancheros! Being a Sunday we had around a 15 minute wait, but the time passed quickly, and soon we were ordering our favorite dishes. We were back home just before 11 am, just as the 1st quarter in the Bronco/Bengals game was finishing.....it was 7-3 in favor of the Bengals. One more time my Broncos came through winning, this time, with their offense, 29-17. 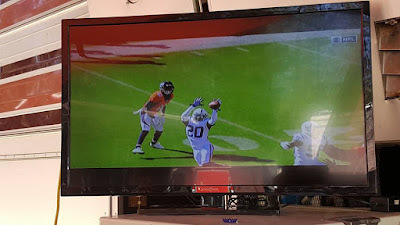 There were a number of good games in the morning, however, most of the afternoon games were one sided affairs, but I watched, nevertheless, it is, after all, the NFL. As the afternoon games were coming to an end the temps began to drop, and I thought about heading inside, but I stayed outside glued to the TV as one game (L.A. Rams vs. Tampa Bay Bucs) had a one hour weather delay (lightning)......the game was delayed right at the 2 minute warning withe Rams in a 3rd down, and 11 yards to go for first down. In the end, the Rams prevailed for their second victory of 2016. The Sunday night NFL game on NBC featuring the Cowboys at home vs. the Bears, which was won by the Cowboys to end an 8 game home losing streak. .....as it turned out Vin Scully's final home call of his career was a walk off home run by Charlie Culberson to win the game Sunday, and to clinch the Dodger's fourth consecutive NL Western Division championship.....what a way to go out! TLE had me grill salmon steaks on the Sea-B-Que whilst she prepared asparagus with hollandaise sauce, as well as sauteed barley with mushrooms......what a great meal to cap off a great day of football gluttony! As we did Saturday evening, we continued watching Season 5 of 'Longmire' (a Netflix original series)....every time we would say "okay, that's it, time to go to bed", we would feel compelled to watch one more episode.....finally at 1:40 am we decided to call it a 'morning'. Another sports figure from my youth succumbed to old age Sunday.....Arnold Palmer gone at 87 years old....RIP Arnie.....you were a gentleman, and a true credit to your sport.....you lived life to the fullest.......you will be missed. 7:51 am - Sunday - 36 F degrees, 55% humidity, wind 6 mph out of ESE....sundown at 6:51 pm today. Got to bed late, and up way too early.....no matter.....I'm off today! NFL and naps await me. Finally, back to short pants and t-shirts weather.....if only for a few days. Thursday and Friday were frigid, but Saturday it got back to 70 F degrees again, and I returned to my normal work wear.....but I get ahead of myself. TLE and I spent the morning taking down some of our 'stuff' in preparation for our move over to Section G in a couple of weeks. I cleaned up our Coleman stove so I could put it away.....with it being so cold in the mornings now I'm pretty sure we're not going to be cooking breakfast outside anymore. I also spent time checking out all my 'engines'......I pulled out the Honda 1000 watt generator and was happy to find that after 5 months of NO use it started on the third pull! Then I started up the 7.5 kilowatt generator, and it caught on the second attempt and ran very smoothly....again, not bad after 5 months of non-use. Lastly I turned over the Detroit Diesel 6V92......it's been about a month since I turned it over, and in spite of it still being quite cold it fired up on the third try.....nice! I let it idle up to operating temperature before shutting her down. Once again we didn't go to work until 3 pm (we clocked in about 2:50 pm) and planned on shutting the office/store at 9 pm once again. 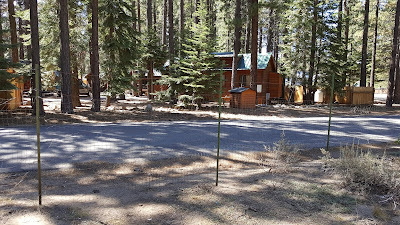 I spent time making sure all the unoccupied sites from 101-111 had logs across them so they could not be used as shortcuts, I fixed a couple of small holes in the fence along Melba Drive.....now that all the big holes are fixed I'm focusing more on the smaller ones. I closed the pool just after 6 pm due to no one using it.....I'm thinking this will be the last weekend for the pool. 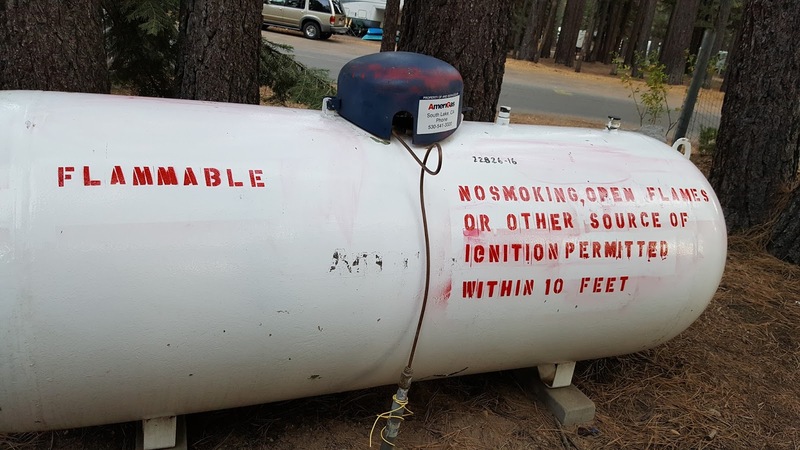 We figure the heater is consuming about 4 gallons of propane per hour with the cold temps, which comes out to almost 700 gallons per week now.....that gets expensive when only 2, or 3 people are using it each day now. As it turned out all our arrivals had checked in and registered by 7 pm, so we decided to close the office/store at 8 pm.....we ended up clocking out by 8:20 giving us our shortest work day since May at 5.5 hours. I think this is the first time all summer we have had no late arrivals (those with reservations)....we are getting many more 'walk ins' each day now as we have so many empty sites. 7:47 am - Saturday - 31 F degrees, 78% humidity, wind 3 mph from SSE, projected high 70 F degrees.....sunny, cloudless......we're in that part of the year when we have 40 degree temperature swings between the highs and lows. The park population surged Friday from a low of 83 sites occupied to 117....probably the last weekend it will get over 100. Since it was Friday the office/store hours go back to 8 am to 10 pm, which means, by default, our hours change to 2 pm to 10:30 pm, however, since it was sooo quiet, we opted to report to work (with Victor's permission) at 3 pm, giving us extra time to laze around, which we did. We'll most likely cut our hours back to about 6 to 6.5 from this point on, and will be going to days again very soon. Beginning October 1st we will begin to shut down Sections A and E, with F following shortly thereafter. We are in a brief warming trend where we will see temps in the high 70's for a few days, then they head back into the 60's and 50's for the foreseeable future with the overnight lows hovering the low 30's and high 20's. We reported for work just before 3 pm, and it was immediately obvious we would not be open until 10 pm. I spent the first couple of hours doing more organizing/cleaning in the maintenance yard before being called to pump propane a couple of times, and deliver a firepit, otherwise my two way radio was very, very quiet. I ran my site checks round identifying a few issues for TLE to reconcile, and then I was out of things to do. We decided pretty quickly we would close at 9 pm instead of 10 pm, leaving Victor to handle any last minute emergencies that might arise up to 10 pm. We were home by 9:20 pm having worked just 6 hours.....perfect! On a side note, we are still looking for more workampers for the 2017 summer season. We've been authorized to hire up to 25 workampers, and we currently have around 15 who have committed to work next summer. If you are interested please contact me at chockwald@gmail.com! 7:37 am - Friday - 29 F degrees, 78% humidity, wind - calm, sunny and clear....rocking 4 electric heaters (one in the water bay) to fend off the cold. That being said we only left the salon electric heater on last night set at 60 F degrees, and it only got down to 60 F degrees in the bedroom......nice differential, huh? I guess it was only fitting that the first day of Fall saw me wearing my Fall wear to work for the first time since late May.....it's been almost five months now since we arrived at TVC, and we have come full circle weather wise.....the only thing missing is snow on the ground. Friday was also the second day in a row that our total sites occupied was under 100.....Thursday we only had 83 sites occupied. After changing clothes I headed over to Section A to work on some fencing that was in need of attention, then got the 'Who's In the Park' list from TLE and did my site checks. It didn't take too long with only 83 sites occupied, and over 2/3's of those occupied sites are in Sections G and F. I had planned a few other work activities Thursday, but the falling temperatures ruled out several of those projects. I decided it was the perfect time to get the company chain saw and cut up some of the longer pieces of firewood I had previously collected so they would fit in my portable fire pit. TLE was a little under the weather and went home about 3 pm, and since we only had 10 arrivals scheduled, it was decided to close the office at 5 pm. I agreed to stay on the clock and run around the park once, or twice an hour until I clocked out sometime between 7 and 8 pm. Each time I left the warmth and comfort of the Newell was painful as it was already into the 30's by 7 pm. I made my last run down to the maintenance yard to let a customer retrieve their stored trailer around 7:30 to lock up, and then punched the clock at 7:45. ......IMDB gives this Ron Howard movie 8.2 stars out of a possible 10......for me I would be right near 10.......its run time is 2 hours and 17 minutes, but it did not seem that long at all. 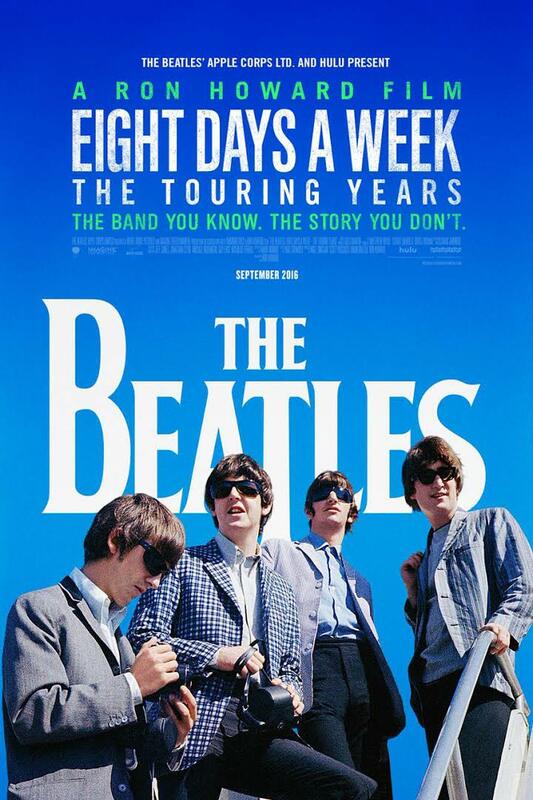 If you are a fan of the Beatles, this is a must see. 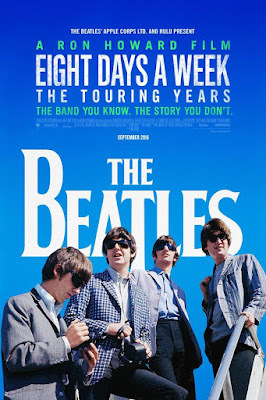 The movie ends with a few minutes of their rooftop performance at Abbey Roads Studios.....their last performance together as a group......very nostalgic. 7:30 am - Thursday - 33 F degrees, 34% humidity, wind - calm, sunny, cloudless skies. Projected high for Thursday......51 F degrees......COLD! Wednesday was departure day for our friends Charles and Bobbie, but the Jello had other ideas. They had planned to be on the road by 8 am, however, one of the slides on their trailer would not retract, and so began the 3+ hour odyssey to fix the problem. 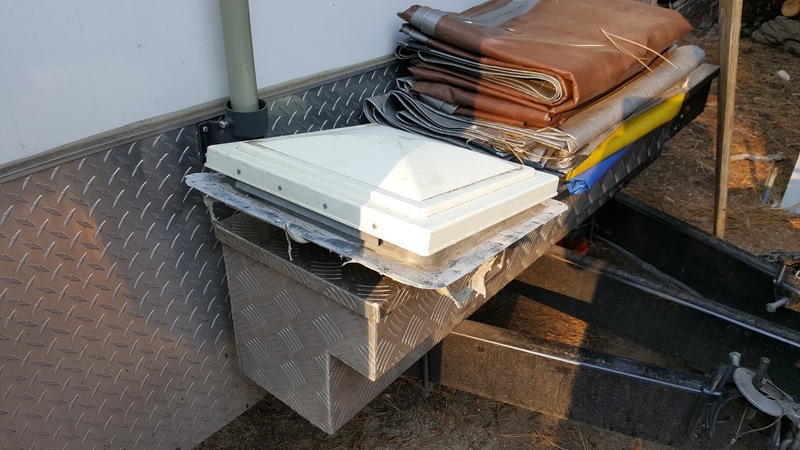 Ultimately they had to call a local mobile RV service to get help, and with his help they were able to get the slide retracted. As it turned out the gear box had malfunctioned causing the problem, and they had to remove that in order to manually retract it. By that time it was after 11 am, but their destination was only a 100+ miles away. 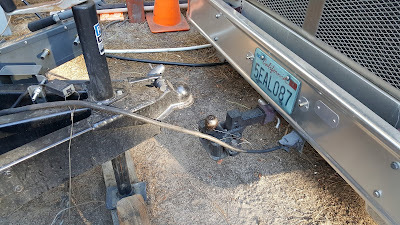 We got a text around 8 pm advising they were staying with friends for a few days after dropping off the trailer at a local RV service and repair place to get the slide gear box replaced. We, obviously, had to be at work at noon, so we got ready and were clocked in by 11:51 am.....another very quiet day.....it began to sprinkle on and off, and that continued until about 3 pm. At times it rained quite hard, or what has passed for 'hard' this summer. Anything to keep the dust down! It was a perfect day to spend down in the maintenance yard cleaning and reorganizing the electrical/plumbing shed. It has been a mess almost from the very beginning going back to May, but there has just not been time, plus there were just too many people in and out of there to do anything that would be long lasting. Now that there are just a few of us left it was time. As I worked separating 30 amp breakers from 50 amp breakers, separating screws from washers, bolts from nuts, elbows from T's, I could hear the rain beating on the metal roof of the shed from time to time....the time just melted away.....before I knew it my watch read almost 5 pm, and I had not taken 'lunch' yet. Just about the time I glanced at my watch TLE's voice comes over the two way radio asking if I was ready to take a break......of course I am....I picked her up at the office/store, and we headed for the Newell. After lunch I went over to the pool, which was unoccupied, and found that the water was cloudy, and then discovered all the skimmer filters were clogged with pine needles, which was a bi-product of the winds we had most of the day. I began to empty out the filters, but then realized the surface of the pool was covered with floating pine needles, so decided the most effective way to begin was to get the long handled net to skim the pine needles out of the pool. Once that was done I then emptied the filters. Inside the pump house we have two more filters that catch anything not caught by the pool skimmer filters, and they were also clogged to a lesser degree. Once they were clean I checked the PH, and chlorine levels, made adjustments and then left the pool equipment to do the heavy lifting of clearing the water. By the time I finished with the pool it was 6:45 pm, and it was time to begin emptying trash cans in the office/store/lounge. Things were very quiet the last hour....we had a couple of 'walkins', and one reservation show up, but that was it. We clocked out just after 8 pm, and were home by 8:15 with another TVC day in the books. The weather is definitely getting cooler as we edge towards the the Fall Equinox, which, coincidentally is today (September 22nd).....it definitely feels like Fall has arrived. 7:54 am - Wednesday - 52 F degrees, 66% humidity, wind 1 mph out of the west.....partly cloudy, sun breaking through......rained on and off most of the night. Slept well....loved hearing the rain on the aluminum roof! Checked my checking account online to find our paychecks had been deposited......YAY......three more paychecks and we are out of here. 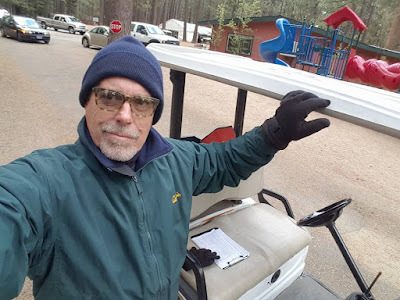 Tuesday began with my writing my blog as usual, and then outside sweeping pine needles off the 'grass' and awning mat, then raking our site to kind of spruce it up a little, then began to get ready for work at noon. We were on the job just before noon, and I immediately did my site check rounds......down to 105 sites occupied. As I made my rounds I noted several sites where there was trash left behind by the customers, as well as one with three BBQ's left behind, and also 2 sites in the tenting area where two sites posts had been knocked over. After I turned in the results of my site check round to TLE I headed back to the sites with trash in them and quickly picked it all up, then headed over to the site with 3 BBQ's, picked them up and took them back to the maintenance yard, got the post hole digger, dug new holes for the site posts, and reset the posts. I spent time dragging logs to plug up holes where vehicles had been driving illegally, drug logs across sites 101-104 to keep people using the dump station from using them as shortcuts.....yeah, I was busy. Then I got a call that there was no 50 amp in site 183, so I got my tools and headed over to see what was what. I tested the 30 amp outlet and there was power, but there was none whatsoever in the 50 amp outlet. I then noticed something odd.....there was just a single 30 amp breaker for the 50 amp outlet, which made no sense at all, so I got out my tools to open up the pedestal. When I opened it up I saw that the 30 amp breaker was not hooked up to anything, and there were no hot wires going to the 50 amp outlet.....wait, what? How is that possible? There was no evidence it had been hooked up for years, and the 30 amp breaker just appeared to be there to fill the space next to the other 30 amp breaker. Why we have never had a complaint about this pedestal in the three years I have been here is puzzling Nevertheless, I headed to the maintenance yard to pick up two 50 amp breakers and some appropriate wire to connect the breakers to the 50 amp outlet. It took me about an hour to get it all wired up, and put back together, but I was successful. I'm still puzzled at why no one ever complained, because we do sell that site as a 50 amp site, and I know we have had numerous 50 amp rigs in that site this summer....ah well, one of life's unexplained mysteries. My next gig was to help the lady in site 151 connect to the internet, which I did successfully.....she offered me a beer for my efforts, but I declined as I was still 'on the job'. Next up I had a call to report to site 112 to help the gentleman set up his portable tripod satellite dish.....that is not something we really do, and I have no experience setting up one successfully......ever. I did show him where he would have to set his dish up to have access to the 'southern sky', and left the rest to him. I've watched my neighbors setting up their portable dishes, and I know how long it can take, and the one thing I didn't want to do was get stuck for an hour doing something at which I had absolutely no chance of being successful. By this time it was after 5 pm, I feeling like a human ping pong ball, and I hadn't taken my 'lunch break' yet, so I headed for the coach to each lunch and take a short nap.....yup, I was beat after 5 hours of doing what I had been doing.....beat! By the time I was back to work it was after 6 and the end of my shift was in sight. I closed the pool early because there was no one using it.....by the way, the problem with the pool heater was the lack of propane as I surmised.....the propane guys came Monday and filled our tank, so order in the pool world has been restored. 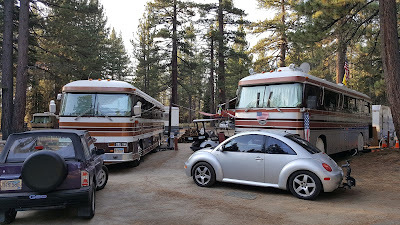 We were home by 8:20 pm, and sitting by the fire with our friends Charles and Bobbie for their last night here at TVC....originally they booked 5 nights, but like almost everyone who comes to Lake Tahoe they added 2 more days to make it a week. I was in bed a little after 10 pm, and TLE a short time later.....thanks for stopping by! 7:59 am - Tuesday - 48 F degrees, 52% humidity, wind 1 mph out of west....sundown for the first time since April will be before 7 pm......sunny, cloudless. The old 'static' vent.....you served us well! The new Fantastic Fan installed! ......I didn't have time, or should I say, didn't take the time to install the trim piece on the inside as it will need to be cut down to fit properly....I'll do that Tuesday. I did take time to drive down to the maintenance yard to wash off two weeks of dust and grime. Once that was done we headed over to Scotty's TruValue Hardware Store, and then DIY (Do It Yourself) to get pricing on 350 of fencing. As I wrote previously we have approximately 335 feet of gaps in our fencing at the extreme south end of Melba Drive. 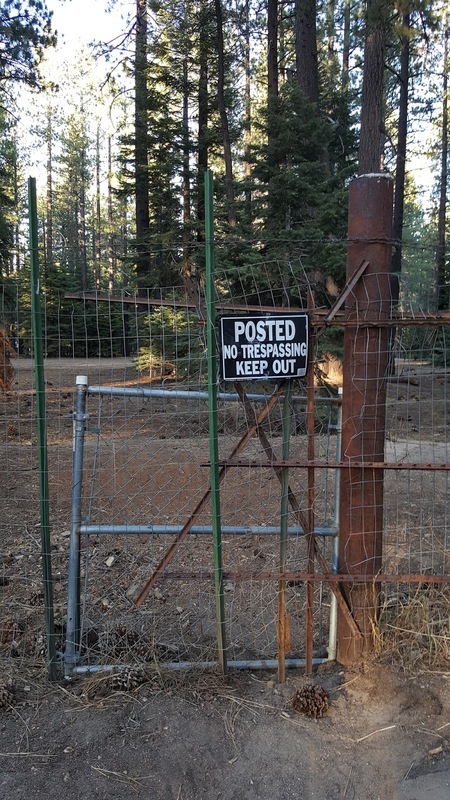 Victor and Robert asked me to spearhead the acquisition of fencing by getting pricing. 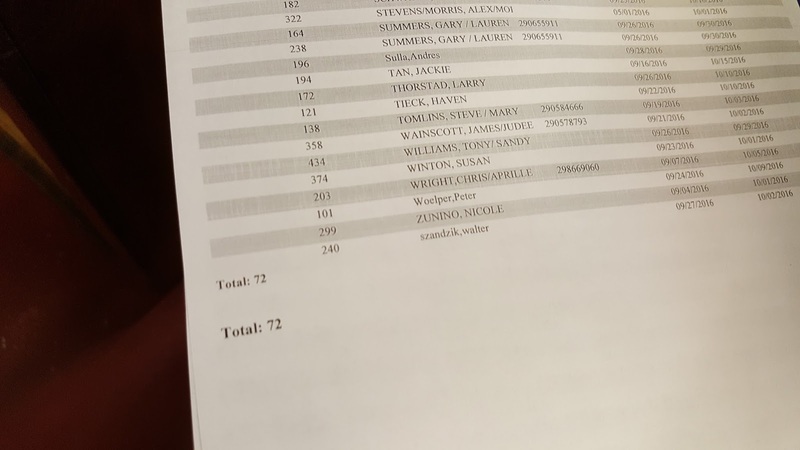 Scotty's had the best price at $55/50' X 4' for welded fencing bring the total cost in at $385 (plus tax) for 350 feet fencing....slightly over $1.00/foot.....not bad. 7:50 am - Monday - 36 F degrees, 67% humidity, wind 5 mph out of south......sunny, clear, blue skies. Another day off, a few naps, installing the new Fantastic Fan in the trailer. It got to 81 F degrees Sunday, but that just lent itself to watching the NFL outdoors. As I sat at my computer around 7:17 am checking to see when the Broncos would be playing, and on what channel.....surprise, surprise, surprise....their game is not being televised by the networks. This happened often last year, and no doubt it happens to many of you who have a favorite NFL team, and only want to watch them play each Sunday, Monday, or Thursday. 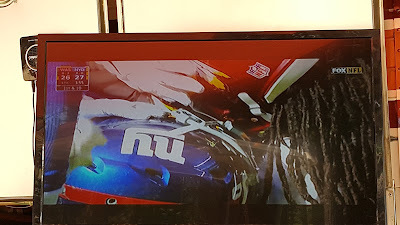 I've toyed with getting the NFL Sunday Ticket for several seasons, but never pulled the trigger, but this time I was bugged.....I wanted to watch them at home against Indianapolis. I brought up the DirecTV website to investigate the cost for NFL Sunday Ticket, and found it was an extra $45 per month during the NFL season......that's about $11.25 per week......yep, it's worth it. I clicked on the 'ACTIVATE' button, and within 5 minutes I had channels 705 to 718, and could watch any game I wanted......woooohooo! Of course, my reason for changing up my schedule to have Sunday and Monday off was so I could watch NFL football. Last year at this time we were in Cape Blanco at the beginning of the NFL regular season and I spent most Sundays all fall and winter watching football....in fact I spent most Saturday's watching NCAA college football. At any rate, since we decided to remain at TVC until late October it was needful to change my days off for the sake of my football mental health, and now I also subscribe to NFL Sunday Ticket......life is good. We had no plans whatsoever for Sunday except to watch football all day long, and that is pretty much what I did......in between wonderful, delicious naps. We watched the 10 am game inside, but as it got warmer we moved outside for the afternoon games. The Denver v. Indianapolis game was close until the 4th quarter when the Denver defense scored two touchdowns to enable Denver to win 34-20. Unfortunately, my other favorite team, the Seahawks, only managed a field goal in 60 minutes losing 9-3 to the L.A. Rams.....sounds like a baseball score. We moved back inside for the Sunday night game between the Packers and Vikings, and that my friends was what my Sunday looked like. On a side note all that hard work repairing the fence along Melba Drive has manifested itself in sore hands, fingers, and shoulders. I had to soak my hands in epsom salts for about 10 minutes to take away some of the stiffness......an oh are they stiff! The epsom salts helped enormously.....I wish I could soak my shoulders in epsom salts! We were in bed a little after 10....I slept for almost 10 hours....thanks for stopping by! 7:17 am - Sunday - 36 F degrees, 69% humidity, wind out of the south at 3 mph, sunny, clear blue skies......once again. Up too early......once again. Much NFL football will be watched this day. Around 9 am (way too early to be out and about on a cold morning) I drove the Ranger cart, Lucky 13, over to Section F to pickup a large (12' X 34') piece of indoor/outdoor carpeting (all one piece) gifted to me by one of our customers (Bryan) who is here from July to October each season. He doesn't like to haul this stuff back to his winter home. Now, seriously, the last thing we need is another piece of carpeting (we have the artificial turf grass already), so I asked Victor (our assistant manager) if he wanted it. He lives here year round and right now has a very small piece of indoor/outdoor carpeting. This large piece will provide 5 times more coverage outside his 5th wheel......of course he accepted the gift with great enthusiasm. When I arrived Bryan was about half way done rolling up the indoor/outdoor carpet so I helped him finish, thanked him repeatedly for his generous gift, hauled it in the Ranger cart over to Victor's site in Section A, and then unloaded it. I was back to the coach by 10 am at which time I finished writing my daily blog entry. We're going through a minor warming trend and the guessed high would be around 77 F degrees Saturday with the guessed low to come in around 42 F degrees......Sunday it will hit 80 F degrees for probably the last time. As we drove to the office/store to begin our afternoon shift around 1:45 pm I could feel more of a warmth in the air that had been missing the previous two days. After punching the clock I drove back out to the overflow area to see if the fence repairs I had made had survived any additional attempts to breach them, and found them still intact.....good! I continued working my way south along Melba fixing more holes and managed to cover another 100 yards of repairs, which are getting more difficult. This section of fence is probably in the worst condition of all our fencing as it has been neglected for years, but I managed to resurrect it to a state where it will prevent biped ingress. The rest of our shift was pretty slow, however, we kept the office/store open until 10 pm.....I dry and wet mopped the entire building (office/store/lounge and laundry) and we were off to inspect the restrooms, make our last 'quiet hour' rounds, and then home. We spent an hour, or so with Charles and Bobbie around the fire sipping some Zinfandel, talking and laughing. Saturday was a good day for me....only another 150 yards of fencing to mend and it will be on to other challenges.....thanks for stopping by! 8:26 am - Saturday - 41 F degrees, 56% humidity, wind 3 mph out of the south.....clear, blue, sunny skies once again. I forgot to mention in my blog post about Thursday that we got our VW back from Higher Ground Autoworx. We had gotten a few check engine lights last winter whose source was hard to nail down. John spent parts of two days doing his diagnostic magic and found the culprit....a bad PCV valve/hose. I rode my bike over to pick up the VW and drive her home. For the first time in months she started right up with no rough idle.....and no 'check engine' light! Friday was pretty laid back, but I did spend an hour running 12 volt wiring to the static vent opening in the trailer, which, as I wrote previously, I am going to replace with a variable speed Fantastic Fan. Now that the power is run all I need to do is remove the old vent and install the new one. ......what do you think? Will that withstand a breach attempt? Basically I wove 5' steel bars into the fencing and then tied everything off with wire, then added an old chain link gate for good measure. It's possible someone could open that up again, but it would take a couple of hours I'm thinking, if not more. 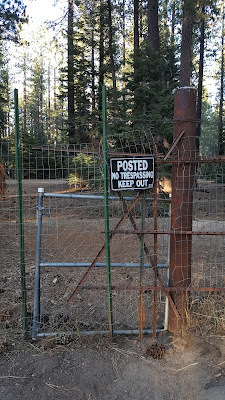 We went to work at 2 pm (we're open until 10 pm on Friday and Saturday nights still) and I worked steadily on the breach, as well as other holes in the fence until after 6 pm......it starts to get a little dark and cold in the woods by 6 even though the official sunset is not until 7 pm. 6:53 am - Friday - 33 F degrees, 76% humidity, wind 4 mph out of the south, sunrise 6:43 am, sunset 7:05 pm, clear blue skies. Slept well....went to bed at 10:30 pm, and awoke at 6:32 am. ......the first hole I closed was the one we opened deliberately when we had the two church groups here for a month to make their ingress and egress easier. I worked from Noon until almost 6 pm and managed to close 90% of the holes, but there are few more, which I will, hopefully, take care of Friday. We were off a little after 8 pm, and headed to Lake Tahoe Pizza for a late dinner with our visiting friends Charles and Bobbie. We essentially closed the place down and were on our way home a little after 9:30 pm. The TVC population continues to shrink.....and without looking at DigiRez (our reservation system) to verify how many sites are occupied, I'm pretty sure we have less than 100 sites occupied right now. It was my decision to haul some of the stuff I took out of the trailer over to the storage shed in the maintenance yard that brought the even emptier nature of TVC to my attention. I also spent a little more time organizing the trailer and beginning to put more stuff away in anticipation of our departure in a few weeks. Our on site Thousand Trails sales guy, Dan Burnette, asked to take TLE and I to lunch at Verde Mexican Rotisserie Grill out in Meyers as a 'thank you' for our help this summer, and Wednesday was the day. Dan picked us up at our site (our car is in the shop as you may recall) around 1:30 and whisked us out to Meyers in just a few minutes. We chose to dine alfresco in spite of the still frigid temperatures, but found a table in the sun which made all the difference. We've gotten to know Dan over the course of the summer, and have become good friends. Dan works the same days we do, and usually wraps up his work day around 9 pm at which time I follow him down to the maintenance yard in my cart where he plugs in his cart to recharge overnight, and then give him a ride back to his car. We had a lovely 2 hour lunch and were back home a little after 3:30 pm. We had friends arriving at TVC in their new to them 42' travel trailer between 6 and 7 pm, so we hung around to be sure we were available to help them into their site when they arrived.....as it turned out Charles and Bobbie had some truck trouble, and didn't arrive until just after sundown, which always adds to the excitement of backing into a site. Nevertheless we got them into their site successfully. We left them to hookup their utilities and get set up, inviting them to join us for a fire at their convenience. 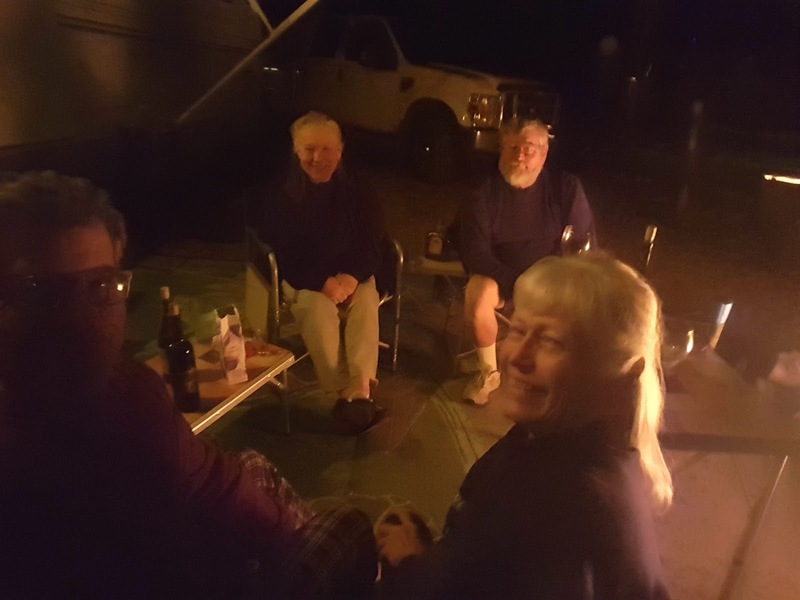 We sat around the fire talking until after 9:30 pm before deciding it had been a long travel day for them and we all headed inside for the night. It's back to work Thursday, but we are changing up our schedule.....while we will still be working the afternoon/night shift, we have changed our days off to Sunday and Monday. I'm sure we will be moving back to the day shift within the next 10 days, or so. 7:29 am - Wednesday - I've been up for over an hour already, but that's okay....I went to bed at 10 pm....probably the earliest I've been awake in a couple of months! Clear, blue, sunny skies, 30 F degrees, 82% humidity, wind - 3 mph out of the south.....wow 30 F degrees! Tuesday we woke up expecting it to rain on and off most of the day, but by 10 am it was just partly cloudy with the sun poking through, and it never rained again here at TVC the rest of the day. Nevertheless, it did rain enough overnight to settle the dust down, which was my hope. I spent time pulling more stuff out the trailer that will not be leaving with us next month, and then cleaned up the mess in the patio area left over from the wind and rain the last 24 hours. I had to turn on the heater in the trailer for the first time in two months, and in spite of that I was still chased back inside by the mid morning cold......it never got above 57 degrees Tuesday. ......as you can see from the view looking southwest along US-50 it was still heavily overcast, but we never got anymore rain. I didn't find anything at Goodwill I couldn't live without, but TLE did find a skirt. After a quick stopover at Raley's we were back home before 1 pm. I promptly retired to my recliner for a nap, and then spent time reading before we decided to watch a recording of the 'SYTYCD'* finale, which was won by 'Kida'. This SYTYCD season was entitled 'The Next Generation', and featured kids ranging in age from 10 to 16......the maturity level of these young kids as dancers was startling. We thoroughly enjoyed this season! It was just a lazy, relaxing, wonderful day.....a perfect off day.....thanks for stopping by! 8:48 am - Tuesday - Cloudy, rainy....something different...44 F degrees, 75% humidity, wind - 5 mph from SSW. It rained for maybe an hour early this morning....maybe a little longer. That is the first significant rain we have had in over two and one half months. I don't now if it will be enough to settle the dust....I hope it is. We are off work now until Thursday at Noon.....nice. Monday the only evidence a weather front was moving in was the 20 mph wind from the south for most of the morning. I drove the VW over to Higher Ground Autoworx around 9 am to have some diagnostics done. Over the past year I have gotten three, or four 'Check Engine' lights with no apparent cause. He is going to spend time trying to figure out what is causing them. I rode my bike back home and then spent about an hour beginning to clear out some stuff that will not be leaving TVC with us. I need to spend a couple more hours, but I made a good start and the trailer is already looking more spacious. I'm going to spend time Wednesday installing the vent fan I wrote about yesterday and doing some more house cleaning. ......now, for the first time in over 3 years, we have all five swings in operation! I spent the next few hours driving past all the sites to remove expired site tags, pick up trash, and any wood left behind. Once again I ended up with two loads of wood that were added to my pile....I could have picked up more, but stayed strong. I spent about an hour using the long handled pool net to skim floating debris off the surface of the water....the 20 mph winds blew a lot of pine needles and other pine tree flotsam and jetsam into the pool (and everywhere else in TVC for that matter). We were home by 8:20 quickly putting away our outdoor chairs in advance of the forecast rain I wrote about earlier....we were in bed by 10:30 once again.....now for a couple of days off from work! The 'weather guessers' were at it again.....originally the forecast for Tuesday was 90% chance of thunder showers going on most of the day with a guessed low of 29 F degrees.....we got a little over an hour of rain, and the low only got to 35 F degrees. 7:59 am - Monday - 57 F degrees, sunny, blue skies, 23% humidity, breezy, forecast high - 66 F degrees. Tuesday the forecast shows 90% chance of thunder showers with a high of 57 F and a low of 29 F degrees. Sunday morning I decided I would put my new Trailer Valet to use to move the trailer forward 2+ feet so I could plug it into the Newell and get 12 volt flowing to the trailer once again. Why you might ask? Well, I bought a Fantastic Fan to replace the existing 'static' roof vent......I thought it would nice to be able to vent out the hot air once and a while. 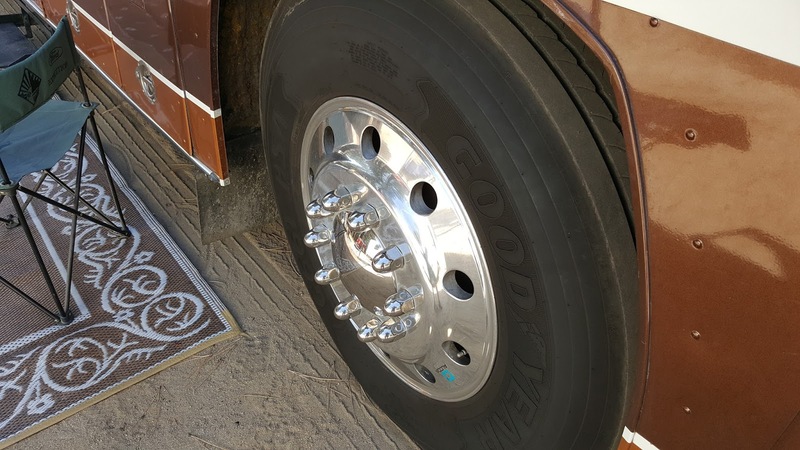 At the suggestion of one of my readers I placed a piece of 3/4" plywood under the wheels of the Trailer Valet to provide adequate traction......as you know we are parked on hard packed sandy soil, and with the almost 500 pound tongue weight on sandy soil traction would be an issue. It took a little while getting the trailer moving forward as the 4 tires had settled a little, as one might expect, into the soil over the past 5 months, but it did begin to move and with the aid of the built in braking mechanism I was able to stop it just where it just close enough to plug it into to the Newell. Trailer plugged into 12 volt once again! 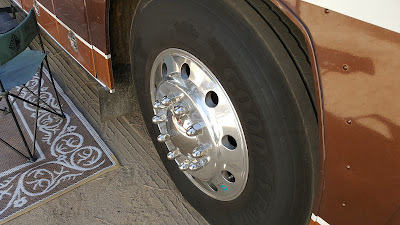 By the time I finished putting the tire covers back on the trailer tires, the sun shade back up, and the jacks under each corner of the trailer to keep it more stable it was almost 11 am, and we were going to work at Noon. Yep, our schedule has changed......we are now closing the store at 8 pm Sunday night through Thursday night, but it will still be open until 10 pm Friday and Saturday nights for the next two weeks. We were on the job about 11:55 am, and for the first time in 6 weeks I returned to my regular Ranger duties.....making site check rounds. I was the only Ranger on duty Sunday, and neither the sites, nor the departures had been checked for a couple of days. As I drove around the park I was startled at how much emptier TVC looked and felt. Most of our long term customers (here most of the summer) have departed, and the remainder will be out by the end of the week, headed back to sticks and bricks lives, or continuing their full time travels. 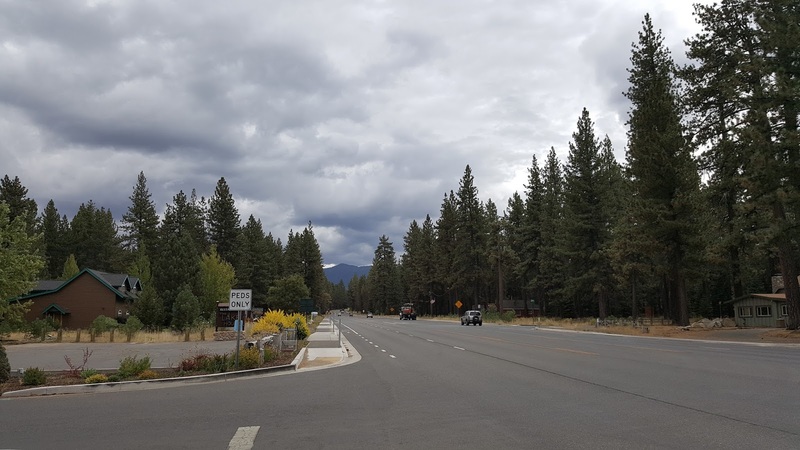 This is our first time in the Tahoe Basin after Labor Day in many, many years and it is obvious the weather is changing and cooling at a fast pace. After finishing my site check rounds I headed to the maintenance yard to begin working on getting the new swings I ordered way back in May prepped and ready for installation. 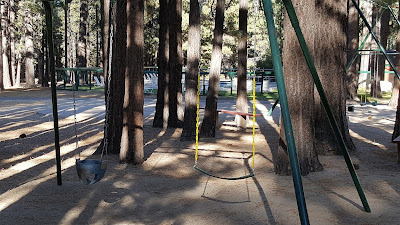 With the purchase of the quick connect shackles Saturday I was able to now install the swing hangers to which I used the quick connect shackles to hang the swings. I managed to get the one swing installed on the 'kiddie' swingset and will get the other swing on the big swingset installed Monday. I had to add 6 feet of chain to each side of this swing seat, which will be installed on the big swingset. 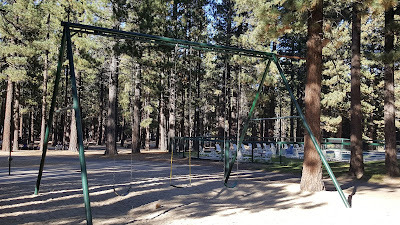 The new swing seats come with 5 feet of chain and we need at least 11 feet for them to work on the big swingset. While I was in the maintenance shed I spent some time cleaning up, and putting tools away in their proper places. There are only a couple of us who actually put tools back after using them, so at least once a week someone (Adam, or I) have to put them away so they can be found the next time we need them. I was called to site 148 to replace the 30 amp plug which had partially melted due to heat generated when one of the cables inside the pedestal whose insulation had worn away was rubbing against a power buss. I wrapped black electrical tape around the cable where the insulation had worn through, then replaced the plug and we were back in business. The time just flew by and pretty soon we were closing the Lounge at 7:30 pm so I could begin dry and wet mopping. I finished just after 8 pm, and then TLE and made our bathroom rounds before clocking out at just 8:30. 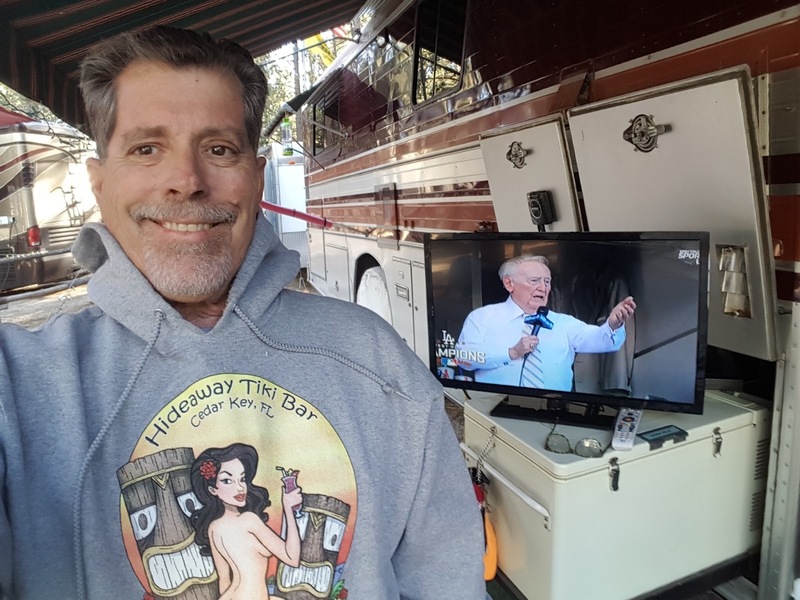 We watched an episode (season finale) of 'Last Ship', then TLE watched a couple of recorded cooking shows ('Chopped' and 'Beat Bobby Flay') and we were in bed by 10:30 pm....hence the early hour at the top of this blog post. 7:29 am - Sunday - 42 F degrees, 66% humidity, clear blue skies, windless, projected high - 77 F degrees......awake too early. Once again TLE and I reported for work at 2 pm in anticipation of a workload that never materialized. 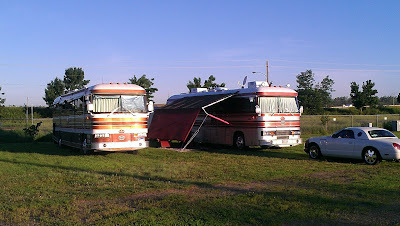 We had a large group sponsored by an RV dealer in Reno, NV (Sprads RV). 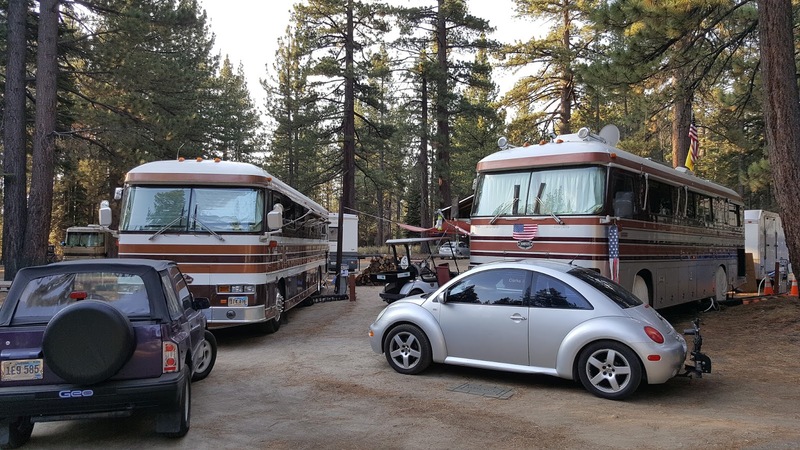 Each year they sponsor a two day event inviting customers who have purchased RV's from them in the past, and they pay for one night. Many of those who had signed up to come did not, so in spite of being 100% booked on paper, our occupancy was just over 50%. ......it took me a little bit to get my technique down, but I think over all it came out alright. In all it took me about 3 hours as I had to do this on both sides, and didn't have quite enough N's, or T's to do it all at once. I was able to do three, or four words at a time, wait for the paint to dry before removing the stencils and then move them to the other side before going to the next words.....there are a lot of N's and T's in this warning! I helped Adam, our maintenance manager, fix a 'open ground' in a 30 amp pedestal, patrolled the park, helped the Sprad caterer ferry large platters of food they were keeping in our walk in cooler in the store over to the Group Site, checked a couple of cable TV connections (again, not our problem, but something wrong with the wiring in the RV's), helped a few folks into their sites, and used the bullhorn to announce our 'Live Music' for the evening......yeah, I know.....I thought we were done too, but Robert forgot to call the performers to tell them not to come. I made a run with Victor (assistant manager) over to the local TruValue Hardware Store to pick up a few things for projects I'll be working on the next week, or so......quick connect shackles for the swings that never got installed, bailing wire to fix all the holes in our fencing along Melba Drive (that may take over a week all by itself), and street paint so I can finish refreshing all the street markings in the park. We closed the store by 10 pm, and began our quiet hour rounds of the park, plus our restroom run.....we, surprisingly, had to stop at several sites to quiet folks down......in one the music was so loud I would have asked them to turn it down if it were broad daylight....why folks think playing music that loud in a campground is acceptable is beyond me. Due to the number of people needing to be quieted down, and the need for us to go by a second time to be sure they quieted down, we didn't clock out until after 10:40 pm. Sunday the Sprad group will depart the park, and we will be a ghost town once more.....thanks for stopping by!